Why we need more females in certain fields. What is the big deal about STEM and girls? In a nutshell, the world has massive challenges that require Science, Technology, Engineering, and Math (STEM) solutions. However, we don't have enough scientists, tech experts, engineers or mathematicians to fix these concerns. While males enter STEM career fields in strong numbers, females simply don't. Girls' interest in STEM subjects often peaks in grades four and five, then declines through middle school and beyond. So, what can be done to foster more female affinity for STEM? Helping young girls engage in science and math in an everyday kind of way builds a lifelong love. This encouragement keeps girls involved even when peer pressures rise and competing interests take center stage. Even if your career background doesn't lie in a STEM area, you can still easily enable your child to connect to science, technology, engineering, and math in meaningful ways. In fact, your participation in your child's exploration can be as easy as 1, 2, 3! First, model the behavior you want to see. Kids who watch their parents read are more likely to become readers themselves. The same concept holds true for STEM learning. Sharing your wonder and curiosity about the world is the single greatest thing you can do to help your daughter become excited about discovery, which is at the very heart of STEM. Make STEM part of your daily conversation. You don't need a degree in science to follow scientifi c advances and discuss them with your daughter. Just show her that you are interested in this type of news. Discuss what you learn and — more importantly — the questions that arise in the process. Use these inquiries as springboards to discovery. Second, practice science and engineering! Science isn't really about lab coats, clipboards, and inaccessible terminology. It's about the process of discovery and problem solving. Your daughter's world is already fi lled with science. Help her dig deeper into it and understand what is going on when she cooks (chemistry), gardens (botany), or takes care of the fi sh (zoology). Your local librarian or indie bookseller can lead you and your family to many wonderful and inspiring books on these subjects. Hunt online for easy experiments that you and your child can perform together. Also try to invent something to solve a problem in your house or garden. For example, consider how you can keep squirrels off of the bird feeder, and then plan out these scenarios in detail. Build and test potential designs. When some of them fail (as most inventions do), celebrate these moments as important steps in the learning process. Keep trying! Helping your child learn to embrace failure is essential to success in STEM and every aspect of life. We must shift the focus of common conversations we have with girls from how they look to what they do. Asking girls what they make and what interests them challenges them in a positive way. It's fine for a young girl to want to become a princess, but why not encourage her to become an princess and engineer or scientist? Get her thinking about what she can invent or build to improve her imaginary castle and the lives of her royal subjects. Girls are, of course, smart and tough, and they respond well to challenges. 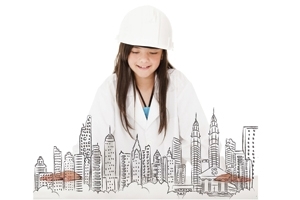 Provide your daughter with such character- and knowledge-building opportunities. Make your child aware of women and men who follow their own paths. As Lindsey Shepard of GoldieBlox (a toy company seeking to inspire the next generation of female engineers) says, "Hire a female plumber, draw attention to male nurses, start using the term 'police officer' instead of 'police man.' Point out women in technical jobs and positions of authority. Don't be afraid to overcorrect; the world does a good job of setting them back to neutral on its own." Not every girl will grow up to become an astrophysicist or mechanical engineer and nor will every boy. We don't need them to do so, but we give our children a better chance at finding their own path — whatever that might be — if we help them embrace STEM and learning early on in life. There are more than 200 children's museums in the United States that offer STEM exhibits and programs: www.childrensmuseums.org. Andrea Beaty is the New York Times bestselling author of Rosie Revere, Engineer (Harry N. Abrams); Iggy Peck, Architect (Harry N. Abrams); and Attack of the Fluffy Bunnies (Amulet Paperbacks). Beaty presents lectures to thousands of school kids every year to share her love of writing and STEM. She acts as an advocate for girls in STEM and for the global education of girls. Visit her at www.andreabeaty.com.